Many hedgerow plants come to our attention as they clamber over the other shrubs and plants. Some like honeysuckle and old man’s beard (Clematis) create an attractive display, whilst others like the bramble are less attractive - though the individual flowers are a delight (as is the fruit). 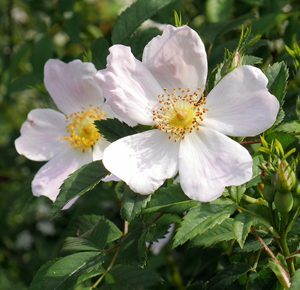 The dog rose (Rosa canina) is found in many hedgerows, and like the field rose (R. arvensis) it is a common plant. Roses are often host to various species of fungi - especially the Rusts. Bright orange / yellow patches may form on the undersides of their leaves and / or stems; these are the massed spores of the rust fungus as it begins another stage in its complex life cycle. The two Roses are often confused, the table below hopefully offers some pointers to distinguish between them. 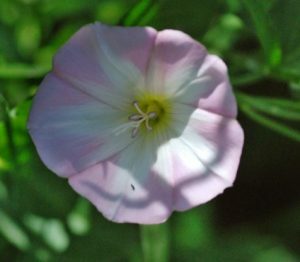 The flowers have 5 pale pink / white petals with yellow stamens. Fragrant. Occur in clusters of up to four flowers. Has flowers with 5 creamy white petals (whose sepals may be purplish). These may occur in clusters of up to six flowers. The fruit (hips) are red but slightly elongated / egg shaped. The fruits (hips) are red but round to ovoid in shape. Flowers June to July. Flowers July to August. The styles (pollen receptive surfaces) do not project beyond the stamens The styles of the flower are fused and project beyond the stamens that surround the styles. They tend to persist on the hips. J ust as roses are a much loved hedgerow species so is the honeysuckle (Lonicera). Its flowers provide colour and also an un-mistakable scent that attracts bees, butterflies and moths (for nectar). The fruit (a red berry) is palatable to various birds, such as warblers and thrushes (though not to us - toxic). The stems of the honeysuckle entwine clockwise around trees and shrubs so it may climb to a height of some 15 feet. 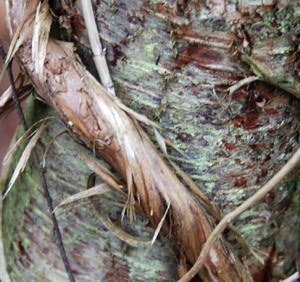 When young, the stems are thin, green and pliant but as they age they become wood and can form thick ‘rope-like’ structures that ‘strangle’ the supporting plant. Whilst the honeysuckle grows clockwise, the field bindweed (below) and the hedge bindweed go the other way. 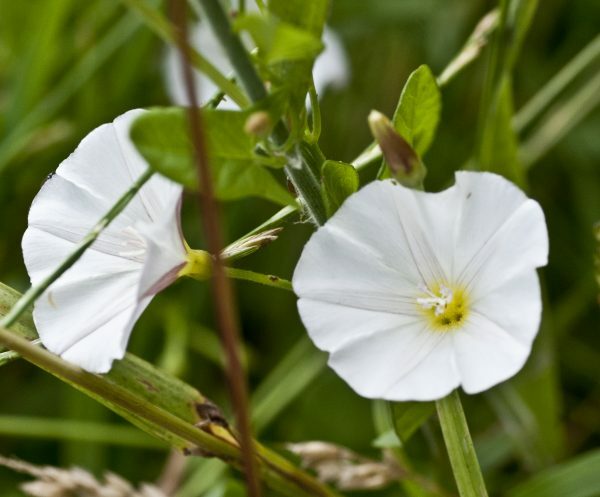 The former has small, pink and trumpet like flowers, whereas the hedge bindweed has rather showy, large white flowers. Bright and welcome they may be in a hedge, less so in one’s garden! Finally, a word about brambles. The bramble (Rubus fruticosus) is to be found in woodlands and hedgerows. It grows with remarkable vigour and is something of a botanical thug, as it can overwhelm surrounding vegetation and indeed a hedge - cutting off light to other plants, leaving them in heavy shade. 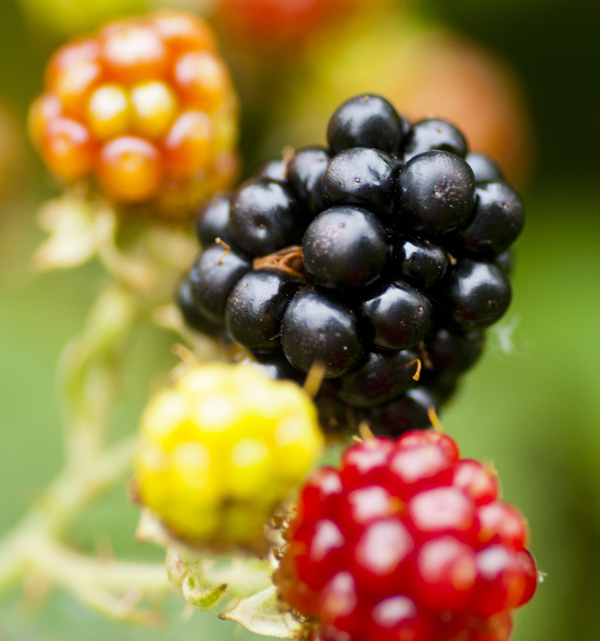 Come the autumn, its abundant and juicy fruits (blackberries) are much in demand for jam making but beware of the thorns which can tear clothing, or indeed, skin.